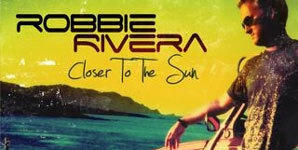 November 2nd 2009 sees the release of Robbie Rivera's single Closer To The Sun, it's taken from an album of the same name released through New State Music and distributed through EMI. Robbie Rivera has had a busy summer, as well as performing at weekly at Privilege in Ibiza, the DJ and producer has also completed a world tour and remixed tracks with the likes of Basement Jaxx and Nelly Furtado. Everybody from Paul Oakenfold to David Guetta are requesting productions from Robbie at the moment, so his name is sure to be one you will hear in the future. Robbie starts a new set of global tour dates in his hometown of San Juan, Puerto Rico on October 31st.